Does Garlic Work as a Natural Antibiotic? The phrase “garlic – nature’s antibiotic” does not seem to be just organic hippie propaganda. Multiple studies have shown garlic to be effective in treating bacterial infections, yeast overgrowth, and parasites. Could garlic be a safer option for treating gut infections or a valuable addition to be used alongside conventional antibiotics? Garlic’s antimicrobial, antifungal and antiviral properties are most powerful if the garlic cloves are eaten raw and crushed. Over 400 compounds have been found in garlic, with approximately 30 of those known to have health effects. The sulfur-rich amino acid allicin is the most important antibiotic compound in garlic. When garlic is crushed or sliced, the enzyme alliinase becomes activated. Alliinase is responsible for converting sulfoxide alliin into allicin. Allicin is a volatile compound and only survives for a few hours. The antibiotic properties of garlic are strongest 10 – 20 minutes after crushing or slicing the garlic cloves. Besides the gut health benefits explored in this article, allicin is one of the only science-backed home remedies for curing a cold fast. These fibers, which feed the good bacteria, are called prebiotics. 17% of garlic’s weight consists of inulin and oligofructose prebiotics, which are able to feed the good guys and promote butyrate production. In a previous post, I wrote more extensively about using prebiotic foods and supplements to treat various health issues. The reactions to eating raw garlic vary. Garlic may irritate the stomach and cause bloating or gas production as a result of the prebiotic fibers it contains. If you are taking medication, have been diagnosed with a disease, or are pregnant, you should consult your health-care professional on the safety of raw garlic before trying it. 1) In order to get garlic’s maximum antibiotic benefits you don’t want to cook it, as heat destroys most of the valuable allicin in garlic. 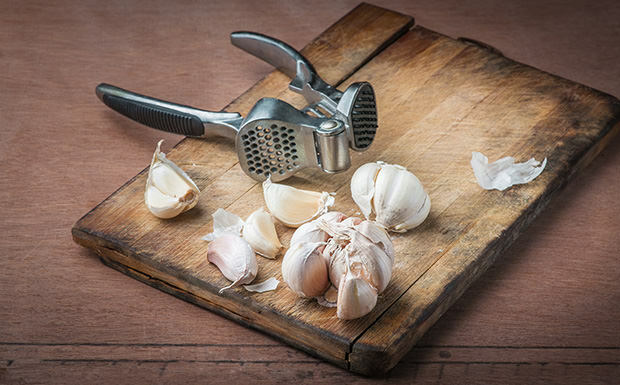 2) You have to eat the garlic clove 10 – 15 minutes after crushing or slicing it to maximize the allicin content. 3) To reduce stomach irritation, it is best to consume the garlic in a glass of water after eating food. This minimizes the gut irritation. 4) To avoid the garlic smell on your breath, place the sliced garlic at the bottom of a glass. Pour just a little water on it so that the garlic floats, and then stir it with a spoon if necessary, before swallowing the whole combination of garlic and water at once. The way I take it, is that I first slice the clove, then put it in a glass, eat my food and drink the garlic-water down after eating. Always start with just one clove of raw garlic to see how it feels. To treat bacterial infections, yeast overgrowth or SIBO, people have been taken 1 – 3 cloves of garlic per day for 1 – 5 days, for example. However, it is important be cautious and listen to your body. 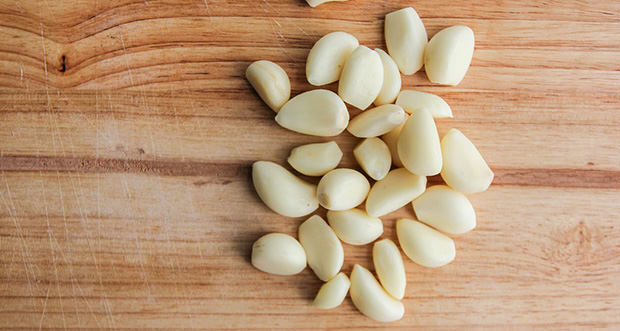 One of the best uses of raw garlic is to treat acute food poisonings. Often just one or two cloves may stop diarrhea or other gut infections in their tracks. Remember that garlic doesn’t suit everyone, nor does it work in every situation. Always see a doctor if you need to. It is also important to note that many of the studies mentioned above were conducted in laboratory settings outside of human bodies. It is not clear whether garlic and its compounds have identical effects in our bodies. Most of the garlic supplements available, such as Kyolic, are unlikely to have any antimicrobial effects because allicin gets broken down in a few days after the garlic is processed. However, if raw garlic does not suit you well, Allimax is an effective supplement in which the allicin is in a stabilized form. If you enjoyed the article, follow the blog on facebook! Interesting. For me, garlic seems to fend off colds and influenzas very effectively but slicing it small and waiting for 10 – 15 minutes before taking it was new for me. I have chopped the cloves to 3 or 4 pieces and swallowed them with juice. That always rids me of sinus infections. I’m gonna try the finely slicing next time I feel some illness threating me. Awesome, thanks for the article! Garlic is Good for just about EVERYTHING. My mother takes it to reduce her high blood pressure. I have used garlic for cold sores in my lips for a few years now. I either cut the clove in half and push the cut edge to the sore for a few minutes or I apply the paste of crushed garlic on top of the sore. This usually heals the sores within a day!